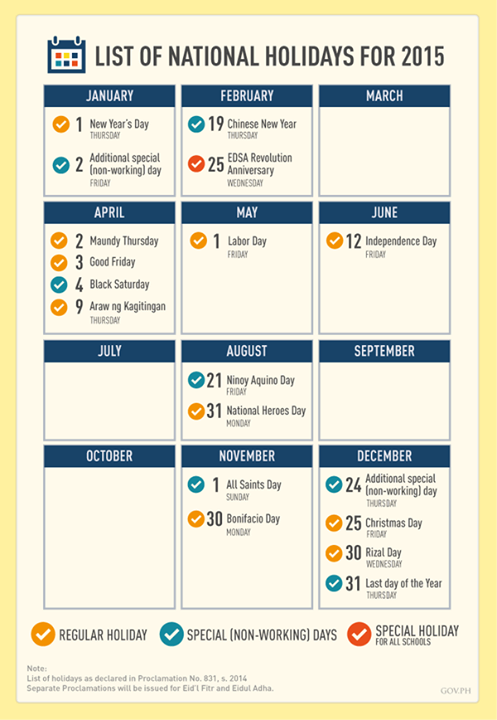 List of Philippine Holidays, Long Weekends in 2015 (Proclamation No. 831, s. 2014) - Balita Boss! The Philippine Government announced holidays based upon Proclamation No. 831, s. 2014, signed by President Benigno Aquino III. The proclamation was released last July 17, 2014. The declaration listed a total of 10 regular holidays, 7 special-non working days and one special holiday for all schools. According to Proclamation No. 831, all holidays, except those religious in nature, will be moved to the nearest Monday. For Eid al-Fitr and Eidul Adha, a separate Proclamation declaring national holidays will be issued after the approximate dates of the Islamic holidays have been determined in accordance with the Islamic calendar (Hijra) or the lunar calendar, or upon Islamic astronomical calculations, whichever is possible or convenient. Start planning your 2015 vacations this early with eight long weekends and other special non-working days. You can also share your plans here and give others an idea of what can be done during holidays. Just leave a comment below.